Among the private lands in Eldorado Valley is the Kesterson Ranch. In 1934 the Kesterson familyJack, Pauline, and son Bobhomesteaded several acres in the west end of Eldorado Valley, living in the building that had been a notorious bootleg joint known as Scrap Iron Mike’s. The ranch stood at the junction of three historic roads: the original road from Las Vegas which came through Dutchman Pass and across Dry Lake; another road which led directly south from Railroad Pass across Eldorado Valley; and a third that led from the ranch to Nelson and Eldorado Canyon where Jack Kesterson had some mining interests. The little ranch house was surrounded by salt cedars and had a gorgeous view of Eldorado Valley and Boulder City in the distance. Jack and Pauline separated in 1942 and Pauline had to learn to drive. She raised chickens and every day drove an old green pickup into Boulder City to deliver eggs and bring back a 50-gallon drum of water. The ranch had no electricity and no plumbing; Pauline cooked on a wood stove, and lived on the ranch in the dead of summer with no cooling. During World War II she spent her days knitting hospital slippers and wheelchair robes for injured soldiers, and baking jelly cakes and cookies for them. In memory of navy boys who died, Pauline floated a wreath on Lake Mead once a year on Navy Day. Pauline died in 1953, and her son, Bob, and his wife, Lorna, lived at the ranch briefly with their first child. Lorna later became managing editor of the Boulder City News and the Henderson Home News, a Henderson council person and, eventually, mayor. Bob Kesterson also served on the Henderson city council. Children playing with matches in 1976 burned down the old ranch house, although several buildings still stand on the propertyincluding a portable Vancouver house the Kestersons moved from 509 Avenue M in Boulder City in the 1950s. The Kesterson Ranch remains an important historical site where pressure is building for development. 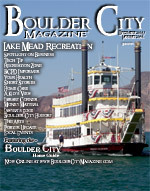 This page is sponsored by the Boulder City Museum and Historical Association. Visit us at www.bcmha.org.